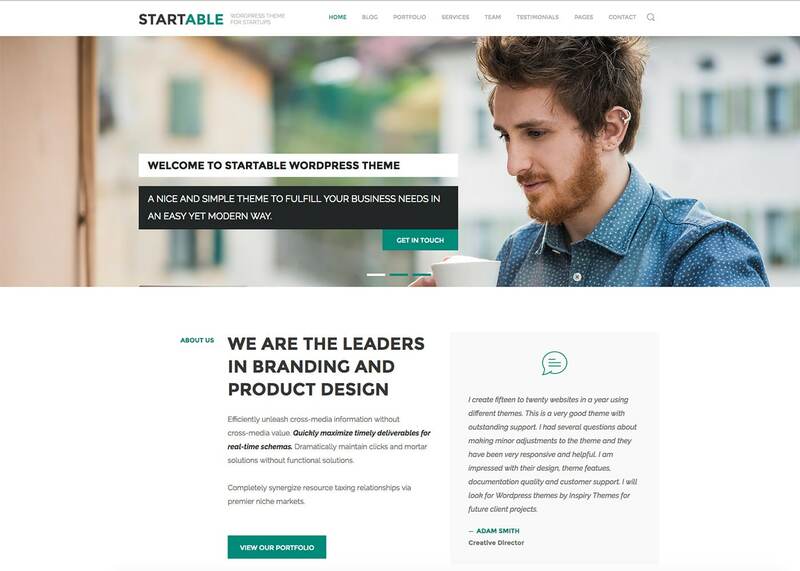 Startable is a WordPress theme especially designed for startups and small businesses. It offers bloat-free user experience with professional design, responsive layout and all the functionality required by a small business. Startable theme provides all its settings in live customizer to help you preview your changes quickly and easily. Startable theme provides a professionally designed slider by default. But, It also provides the flexibility to replace the slider with Revolution Slider. If you like you can also disable the slider and display only a static banner. All these settings are provided within live customizer. Startable theme provides following sections for home page ( slider, contents, about us, portfolio, services, team, news/blog posts, testimonials and clients ). So we provided a section manager in live customizer to show/hide any section and also change the order in which they are displayed. Startable theme provides contents support for home page as a separate section and this section allow you to add custom contents using page editor. You can even use shortcodes from plugins like Visual Composer or any other page builder plugin to add your desired stuff to homepage. Note: In theme demo we have not used any custom contents and this section is not displayed but it is supported to provide more flexibility. Startable theme provides two footer variation. First one displays contact Information with Google map ( As displayed in demo ) and second on displays 4 columns layout with widgets support. Startable theme provides a default contact form for contact page. But if needed, You can replace this form with any good contact form plugin like contact form 7. Startable theme includes customizer settings to modify typography and you can use any Google font on your website. You can enable/disable preloader graphics and also modify the colors used by it using related settings provided in customizer. Startable is a fully hand crafted theme and its developed keeping in mind your website’s good ranking on search engines. Startable theme is translation ready and you can translate it to any language (except RTL) a POT file is included within the theme to help you out. Easy to understand and detailed documentation is included as part of the theme package. Documentation is also available live for your quick reference. Startable theme has full support for child themes and one sample child theme is included as part of the package to help you get started. Startable theme provides one click demo import to help you get started. So, What are you waiting for? Install Startable and take your website to next level.